The name of the Party is the Socialist Party of Ontario. The Socialist Party of Ontario is founded on compassion and fairness. Its purpose is to create alternative institutions to challenge and replace the hierarchical, oppressive and exploitative nature of the existing neo-liberal political structure and capitalism. The Socialist Party of Ontario is committed to the abolition of capitalist exploitation and its replacement by a system of democratically controlled socialist planning. To this end, its members will work continually to ensure that all voices are heard within the party, in opposition to the exclusionary policies of existing political entities. This is the primary objective of its democratic socialist constitution. The Socialist Party of Ontario will fight and organize within the electoral context of Ontario to elect MPPs to our Provincial Parliament, with the ultimate aim of forming a Socialist Government in Ontario. Unlike the other parties currently represented in the provincial parliament, the Socialist Party of Ontario clearly rejects neo-liberalism as an ideology and capitalism as an economic system. It proposes an alternative economic model and policies based on the needs of people and the planet, placing the progressive values of social justice, environmental sustainability, democracy, free speech and equality for all peoples at the forefront. The foundation of the Socialist Party of Ontario is internal democracy. The party promotes freedom of speech and accepts the power of its membership, especially the power of women, people of colour, those who are other abled, those who are gay, and those who are members of the transgendered community, as well as the millions that our economic system has rendered voiceless. It strives to be a pluralistic and participatory party, one that will actively pursue the different perspectives and sensibilities of its membership while maintaining a spirit of democratic unity. 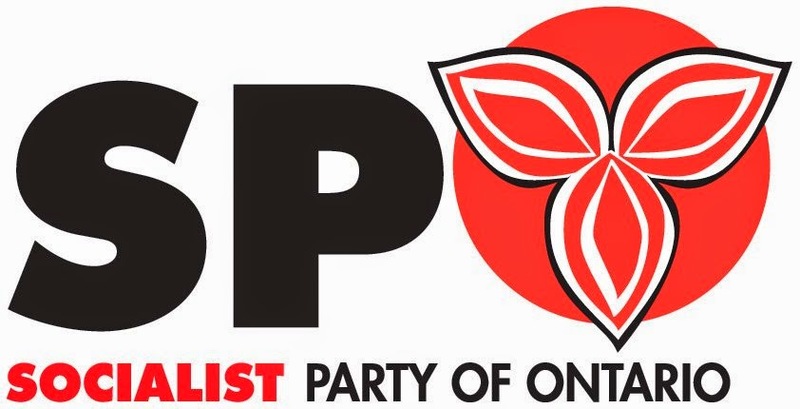 As an egalitarian party, The Socialist Party seeks representation of members from Ontario’s many diverse communities at every level of its membership and leadership. The Socialist Party of Ontario is an electoral force. However, its objectives are broader than the fleeting pleasures of electoral victories. It also seeks to promote the cause of socialism, to take part in social struggles, and to both reflect and push forward the claims and objectives of progressive social groups, accepting their independence from each other while promoting their unity within this overall fight. All persons have the right to equality and the right to be treated with dignity and respect. For this reason, we declare that we unconditionally recognize the right to equality without discrimination or harassment based on race, colour, gender, gender identity, religion, cultural background, disability, sexual orientation, pregnancy, class or economic background or any other basis for systemic oppression and prejudice. We also adhere to the values enshrined in the Women’s Global Charter for Humanity, namely the values of equality, freedom, solidarity, justice and peace. We will work to strengthen these values both within our party and within society. All people deserve and have the right to be treated fairly, equally and with dignity. Discrimination, harassment, insults, denigration, authoritarianism, abuse of power, demeaning attitudes, the use of derogatory language, or the exclusion of anyone for reasons that are used to justify any of these abuses are a manifestation of intolerance and are unacceptable in our party. As a sign of our commitment to equality and respect for everyone, our members are invited and encouraged to bring to all of our attention and to correct any behaviour within our party on any level that would contradict this statement and to bring them to the attention of our Diversity Coordinator who is both entrusted and empowered to take all appropriate steps to ensure their rectification. In this way we seek to foster a genuine culture of free expression and openness within the party, a culture in which all people are treated with dignity and respect. All people aged 14 and over who support the program as democratically decided upon by the membership and who comply with the party’s equity positions can be members of the Socialist Party of Ontario. Low-waged/Unemployed/Youth member $5.00; and Regular member $10.00. These fees do not infer that there is any difference in membership priority—all members are equal. Membership fees cover the member for a one-year period, starting the day they are processed; and that there will be a three-month grace period after their membership expires. Membership levels reflects whether a member is new, in good standing, lapsed, or ex-member; and that these levels be categorized as: Level 1, as new member, with a 21-day inability to vote at AGM’s and meetings (after 21-day probationary period, they automatically become Level 2 members); Level 2, member in good standing (full-rights); Level 3, lapsed (hasn’t paid membership from time it expired until 90-days afterwards, but can rejoin at Level 2, if done within 90-days of membership expiration date); Level 4, ex-member, (hasn’t paid membership fee in excess of 90-days after it expired, therefore if this member rejoins, they will have to do so as a Level 1 member, with all the restrictions that entails). The OMC, or those appointed to help with membership renewal, must send formal notice, either by mail, or by email, to all members when their membership is 60-days away from expiring. The Socialist Party of Ontario acknowledges that genuine democracy includes dissent and that unity cannot come at the expense of the rights of the individual. This applies not only socially, but within our party. All members have the right to seek party office, the right to seek the nomination for the party within an electoral district, vote at party conventions and meetings, to express themselves democratically within the party and to propose party resolutions and positions. No authority within the party can override these proceeding rights. The rights of membership will apply 21 days after the member has been received. Riding Associations, Campus Clubs & Workplace Clubs are the basic units of the party. Both are responsible for recruitment, fundraising, promotion of the party’s principles and programs, and for organizing and political work within the given constituency. Associations and clubs also reflect the views of their members back to the party, and advocate for these views at the party’s Executive level and at bi-annual policy conventions. These clubs and associations are free to take stands on local issues, though they must inform the Executive of these positions. Riding Associations (RAs) are bounded by the electoral districts formally recognized by Elections Ontario. Campus Clubs (CCs) are formed around specific post-secondary educational institutions. Workplace Clubs (Wcs) are formed around a specific workplace, unionized or otherwise. To gain recognition, Associations and Clubs must have and maintain a minimum membership of six (6) members. A new RA, CC or WC may be temporarily recognized by one of the party’s two Spokespersons or by the party’s Organizing & Membership Coordinator (OMC), but this recognition must be reconfirmed by a general vote at the party’s next Executive meeting. RA membership is determined by residency. A party member may join an RA outside of their electoral district as long as her application to do so is recognized by the MS of the RA in question. In no cases can the number of members of an RA who live outside of the RA district exceed the number of those who live within it. CC membership is determined by being an officially enrolled student at the institution in question. No one who is not enrolled in the specific institution may be a member of that institution’s CC. WC membership is determined by being an employee, present or retired, of a specific workplace. A party member may be a member of both an RA, a CC, or a WC but may not represent more than one of those two bodies on the party’s Executive. Every officially recognized RA, CC and WC has the right to elect two members to serve on the party’s Executive, one male and one female. If it cannot find a male representative, it may elect two female representatives. However, if it cannot find a female representative it may elect only one representative until such a time as it can fulfill its equity obligations. Every officially recognized RA, CC and WC must hold at least one general meeting a year. The members must be given at least two weeks’ notice of this annual meeting, as must the party’s OMC. All members must have full voting rights at this meeting, as well as the right to run for RA, CC or WC office, and the meeting must be open to the public. The party’s OMC may, if he/she chooses, send an observer to the meeting. In the event of any disputes arising from such meetings, these will be resolved by a vote of party’s Executive. All RAs, CCs and WC’s must have an elected council consisting of, at least, a Spokesperson/General Contact, a Membership Secretary, and a Treasurer. Any of these may also serve as the RA or CC’s representatives on the party Executive, in conformity with the parity stipulation in 5.6. Wherever an officially recognized RA exists, the RA, and the RA alone, has the right to nominate the candidate to stand for election to provincial parliament in that electoral district, or to endorse a candidate for election at any other level of government. This must be done at a public nomination meeting at which any party member, whether they live in the district or not, will be entitled to run for the nomination, subject to clause 4.4. All members of the RA must receive at least two weeks’ notice of the meeting as must the party’s OMC. Those seeking the nomination may campaign for it in advance by giving written notice of their intention to the RA or OMC. They may do this whether or not a nomination meeting has yet been called. Once a party member has announced their intention to seek the nomination in an RA, they are entitled to receive the full contact information of all those who will be eligible to vote at the meeting. Nominations may also be accepted from the floor by the chair as long as properly moved. All recognized members of the RA will have voting rights, subject to clause 4.4. All nominations must be decided by at least 50% plus one (1) vote of those present, determined by a secret ballot. In the event of a tie in the final round of voting, the tie-breaking vote belongs to the chair of the meeting. 6.1.1 In the event that a “snap” or early general election is called by the government, an RA may request that the Executive of the party waive the required 14 days notification of RA members. All RA members of the party must still be notified of the emergency nomination meeting. The party’s Executive may, if it so chooses, decline to waive this requirement. This right of the RA as laid out in 6.1 is absolute. A candidate, as nominated subject to 6.1, must be recognized as the party’s candidate in that electoral district. In the event that an electoral district does not have a duly constituted RA, a candidate may be appointed by a vote of the party’s Executive. In the event of a serious breach of party ethics, or a violation of the party’s clause regarding racism, sexism, or homophobia, or allegations of criminal conduct, an emergency meeting of the party’s Executive may be called to vote on withdrawing the party’s recognition of a specific candidate’s nomination. This meeting may be called by request of either of the party’s two Spokespersons, the party’s OC or by request of the RA that nominated the candidate. An executive vote of two-thirds of those present (if quorum has been achieved), is required for the nomination to be withdrawn. The candidate in question must be allowed to attend and speak at this meeting in their defence should they chose to do so. This does not override 6.2. A duly constituted RA remains the sole body that may nominate a candidate in its electoral district. The party executive is responsible for the day-to-day functioning of the party and is its governing body between conventions. The Chairperson shall chair executive meetings and Policy/General Conventions and will, using Robert’s Rules of Order, be responsible for maintaining decorum, adjudicating disputes, recognizing speakers etc. They will also be responsible for the minutes of such meetings. In the event of a tie vote at an Executive meeting, the Chairperson will cast the deciding vote. The Spokespersons are responsible for representing the party in public, particularly with the media. They are also responsible for expressing and advocating for the party’s platform, as adopted by the membership, in public forums. Of the two Spokespersons, at least one must be a woman. In addition to responsibilities laid out in Clause 5, the OMC is responsible for maintaining the party’s membership records. The MS also is responsible for membership campaigns. In addition to the responsibilities laid out in Clause 6, the OMC is responsible for overseeing the organizational aspects of the party, the logistics of Executive and General meetings of the party, and for organizing political campaigns. The Treasurer is responsible for all financial operations of the party, and must report on these fully to all Executive and General meetings of the party. The Treasurer also serves as the representative of the Chief Electoral Officer. The FS is responsible for organizing fundraising campaigns. The LGBT Representative is responsible for co-ordinating the activities of the LGBT Council as well as for organizing inclusion/outreach efforts around LGBT issues both within the party and the broader community as a whole. The Women’s Representative is responsible for co-ordinating the activities of the Women’s Council as well as for organizing inclusion/outreach efforts around feminist and women’s issues both within the party and the broader community as a whole. The Youth Representative is responsible for co-ordinating the activities of the Youth Council as well as for organizing inclusion/outreach efforts around youth issues both within the party and the broader community as a whole. This person must be no older than 25 years of age. The Diversity Representative is responsible for co-ordinating the activities of the Diversity Council as well as for organizing inclusion/outreach efforts around anti-racist issues both within the party and the broader community as a whole. This person is also responsible for ensuring that the articles of Clause 11 are upheld. The Disability Representative is responsible for co-ordinating the activities of the Disability Council as well as for organizing inclusion/outreach efforts around disability issues within the party and the broader community as a whole. This person will be responsible for ensuring accessibility of official party events and materials. The Aboriginal/First Nations Representative is responsible for co-ordinating the activities of the First Nations Council as well as for organizing inclusion/outreach efforts around Aboriginal and First Nations issues both within the party and the broader community as a whole. The Labour Representative is responsible for co-ordinating the activities of the Labour Council as well as for organizing inclusion/outreach efforts around labour issues within the party and the broader community as a whole. This person shall be an active member of a labour union in Ontario. The Senior’s Representative is a person 65 years of age or older who works to represent the interests of seniors on the executive and who works around issues of concern to seniors in our community. No person may hold more than one position on the Executive at any given time. The Executive of the party must meet four times per year. These meetings must be rotated geographically. One of these meeting will be held in conjunction with the mid-year Policy Assembly and the other with the Annual General Convention. All members of the party must be notified of the timing and location of these meeting at least three (3) calendar weeks in advance. These meetings will be open to all party members. Party members will be allowed to speak, ask questions and enter into the discussions at these meetings without any hindrance. At these meetings all members of the Executive other than the Members-at-Large will be expected to deliver a report on progress and events in their area since the previous meeting. No member of the Executive may, under any circumstances, be barred from participating in anyway at these meetings, nor may they be removed from office except by vote of the membership at the next full Annual Convention. Notwithstanding Clause 7.5, any member of the Executive who misses two (2) consecutive meetings is considered to have resigned. This may be overridden, in the event that there are acceptable reasons for these absences, by a majority vote of the Executive. The party will hold an annual Policy Assembly (PA) and an annual General Convention (GC). These two conventions will be held in geographically disparate locations and will be at least four (4) months apart. Each PA and each GC must be held within fifteen (15) months of the previous one. As per the Clause 7, the OC will be responsible for organizing these meetings, the Disability Representative for ensuring their accessibility, and the Chair for chairing them and ensuring that they are recorded. The Executive, if these officers are unable to perform these functions, may appoint someone else to do so. In the event of an emergency vacancy, the authority to appoint someone to perform these functions will fall to the Chair or the OC or the MS in that order. These meetings will be open to all party members and all members who attend will be delegates with full voting rights. No member of the party may be refused entry or barred from voting/participating in these meetings. There will be no fee for a member to participate. All members of the party must be given at least four (4) weeks’ notice of a PA or GC. These meetings may also be open to the general public/observers at the discretion of the Party Executive. The fees associated with observer status will also be so decided. The PA is a meeting dedicated to policy resolutions, amendments and discussions. In addition to 8.2, the entire Executive will be subject to election/re-election at every GC. Any person running for office in the party must be elected by a vote of a majority of the delegates present at the GC. A multi-round voting system will be used as necessary to ensure this. In the event of a tie, the Chair will cast the deciding vote. Any member of the party may propose resolutions, policy platforms or amendments to the existing platform either prior to or at a PA/GC. Any proposed prior to a PA/GC will be posted on the party’s various websites/forums for discussion. This will be the responsibility of the OC, though any other officer of the Executive may also add resolutions, policy platforms or amendments from members to these forums. Any resolution, policy platform or amendment, if duly moved and seconded from the floor of the PA/GC will be put to a vote by all members of the PA/GC. Any resolution, policy platform or amendment, if passed by a majority vote at these, will become a part of the party’s election platform. The sum total of all resolutions and policy platforms duly passed as per 8.2.4 will be the party’s standing and electoral platform. The party, its candidates and Spokespersons will run on this platform during elections in its totality. It will be the responsibility of the Spokespersons to advance and reflect this platform in their public activities and pronouncements. No section of this platform, in whole or in part, may be modified or revoked in any way by anybody or official other than through a majority vote of the delegates at a PA or a GC. A PA or GC is the sole authority that may amend or make additions to the constitution of the party. All clauses 8.2.2-8.2.6 apply equally to constitutional amendments, with the exception that such additions and/or amendments must be ratified by a vote of two-thirds (2/3) of the delegates. In addition to its governing bodies, the party will have six (5) councils; a Women’s Council, a Youth Council, a Diversity Council, an LGBT Council, a Disability Council and an Aboriginal/First Nations Council. These Councils will seek to both reflect the aspirations of these communities within the party and to reach out to those outside the party to ensure that the diversity of their ideas are also heard in the struggle to redress the historic and systemic inequalities and injustices faced by these communities. The Women’s Council will be open to all women. The Youth Council will be open to all persons 25 years of age and under. The Diversity Council will be open to all those who self-identify as members of racialised, marginalised and immigrant communities. The LGBT Council will be open to all those who self-identify as members of the LGBT community. The Disability Council will be open to all those who self-identify as other abled. The Aboriginal/First Nations Council will be open to members of the aboriginal and First Nations communities. The Women’s Council will work to ensure that the party’s platform reflects a feminist analysis that fundamentally opposes Patriarchy as a systemic problem. It will also work to both reflect the views of and reach out to women and feminists who are not members of the party. The Youth Council will work to ensure that the party’s platform and analysis reflects the perspective of youth, with a special emphasis on the struggles of marginalized youth. It will also work to both reflect the views of and reach out to youth who are not members of the party. The Diversity Council will work to ensure that the party’s platform reflects an anti-racist analysis that works to build a program that will reflect the views of racialised, marginalised and immigrant communities. It will also work to both reflect the views of and reach out to members of these communities who are not members of the party. The LGBT Council will work to ensure that the party’s platform reflects views that fundamentally oppose and seek to overcome homophobia and transphobia as the systemic issues that they are. It will also work to both reflect the views of and reach out to members of the LGBT community who are not members of the party. The Disability Council will work to ensure that the party’s platform and analysis reflects the views and specific needs of the many diverse communities made up of those who identify as disabled or other abled. It will also work to reach out to members of these communities who are outside of the party. The Aboriginal/First Nations Council will work to ensure that the party’s platform reflects the views and struggle of the community in its fight to redress over 500 years of racist and imperialist oppression. The Labour Council will work to ensure that the party’s platform reflects a pro-labour analysis that address the concerns of the labour movement and also work to reach out to unions and union members. The views, activities, aspirations and resolutions of these Councils will be reflected back to the broader party as a whole through the Coordinators on Executive, who will be responsible for representing these opinions and ensuring that all policy platforms and resolutions brought forward by the Councils are advocated for as proposed at PAs and GCs. The party recognizes that there exists within it currents of thought that are and will be different from and complimentary to the broader consensus and platform. The party, therefore, accepts and encourages both the affiliation of sister groups, parties, union locals and other organizations and the creation of such groupings within the party itself. Affiliates and Caucuses, while they have no specific right to representation collectively within the party, are recognized as groupings and formations within the party. As such, they can both reflect the views of their members back to the party and they can both advocate for the party in the broader community while maintaining their identity. During all Executive, PA and GC meetings of the party they will granted the right to set up information tables/distributions within the meeting itself. All Affiliates and Caucuses are expected to respect the Constitution, fundamental values and platform of the party when operating within a party context or advocating for the party. It has ten (10) members of the party who have adhered to its petition to affiliate or form a Caucus. This petition must be presented to the OC and, upon verification, must be accepted by the OC. or it has been accepted as an Affiliate or Caucus by a majority vote of the Executive. All Affiliates and Caucuses will be entitled to send two (2) Active Observers to all Executive meetings of the party. While they will not be allowed to vote, they will have the right to enter discussions and pose questions. This right cannot be revoked or hindered in anyway as long as the Affiliate or Caucus remains chartered. All contributions and donations that are not the result of local fundraising or electoral campaigns are allocated in their totality to the party. In the event that a donation is made in an area where there exists a local RA or CC, though it was a donation to the central party, 1/3 of that donation will be reverted to the RA or CC. In the event that the donor is a member of both the RA and CC, 1/3 of the donation will be divided between the RA and the CC. The party Executive may, at its discretion, allocate the party’s financial resources in anyway it sees fit. All funds raised directly by a RA or CC remain entirely their own. All funds raised directly during a general election by a candidate remain entirely their own.